To begin with this is not a report that compares opals from Australia and Ethiopia. The information in this report merely seeks to clarify that the opal gems used in Kai Silver opal jewelry, are from Australia and not Ethiopia. With the wide availability of Ethiopian opals which obviously are a much cheaper than their counterparts from Australia, many jewelry buyers have an interesting and valid question. Why does Kaisilver insist on using opals from Australia when, the Ethiopian opals offer a much milder price point. So let us explain our point of view regarding, the origin of Kaisilver opal gemstones. When it comes to white opal, black opal or any other opal excluding pink opals and fire opals, we have for decades been patronizing Australian opals. This has obviously given us a chance to keep a close watch on how, these opals stand up to wear and tear. We cannot claim that Australian opals are as durable as rubies or sapphires, the fact is that all opals require a fair degree of care and caution when worn, stored or cleaned. But within the opal gem family, the opals from Australia have performed impressively well. We do not mean to say that, Ethiopian opals are not as durable as Australian opals but, we have surely not evaluated them long enough to feel confident. If we ever happen to offer Ethiopian opal gems in any of our custom jewelry, you can rest assured that the origin will clearly be mentioned on the report that describes such jewels. On the other hand, if you do require specific use of Ethiopian opals in the jewelry that you order from us, please discuss the matter with our support team. They will make sure that, you are fully aware that the gems used in those jewels will be set with opal gems from Ethiopia and not Australia. Our team at sales@kaisilver.com will be glad to help with any questions or requirements that you might have. You can get the benefit of their expertise without, making any commitment to purchase from us so, do communicate with them for any issue related to gems and jewelry. 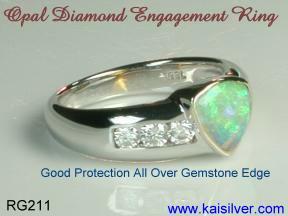 Kaisilver can custom make both gold and 925 sterling silver opal rings with the design and gem of your choice. Unless otherwise stated, the white opal gemstones used in our jewelry are mined from the 'Opal Country', Australia. You can review our Opal Ring Collection ... here.